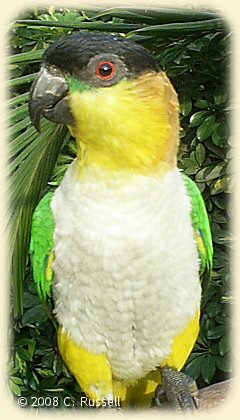 Caiques, hailing from South America, are considered a "New World" parrot. This group of stocky, square tailed parrots have a white breast that distinguishes them from all other parrots. Caiques are monomorphic, males and females do not exhibit any outward differences in appearance. 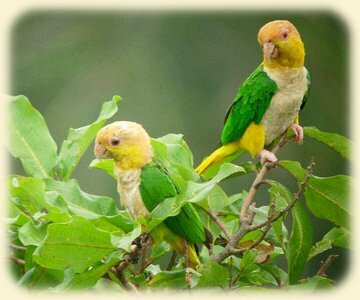 There are two species in the genus Pionites: leucogaster, commonly called the White-bellied Caique, and melanocephala, commonly called the Black-headed Caique. Within these two species, there are five sub-species, two Black-headed and three White-bellied. Black-headed Caiques are approximately nine inches tall and average from 150 to 170 grams at maturity. White-bellied are just slightly taller and average 10-15 grams heavier at maturity. White-bellied Caiques are found generally south of the Amazon River in Brazil, Ecuador, Peru, and Bolivia. They inhabit the forest canopy and show a preference for coastal forests. They are generally seen in pairs, family groups, or small flocks outside breeding season and can often be heard screeching long before they are seen. They spend their days foraging in the treetops, feeding on fruits, berries and seeds. The White-belly Caique consists of three distinct sub-species. The nominate, or main form is Pionites leucogaster leucogaster, commonly referred to as "Green-thighed" White-belly. Although it is the nominate, or main race, very few were ever imported to the US. The sub-species Pionites leucogaster xanthomeria, commonly referred to as a "Yellow-thigh" White-belly, is the form we are all familiar with. 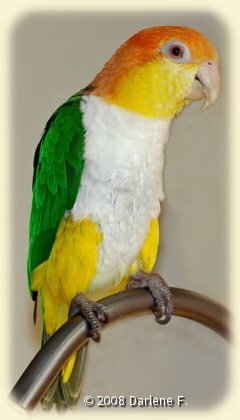 Although it is a "sub-species" it is most certainly considered a White-belly Caique as are the other two. The common names "yellow-thighed" and "white-belly" both refer to the same bird. The third sub-species, P. l. xanthurus, common name "Yellow-tailed Caique," has a yellow tail and is paler in coloration overall. There are no known examples of this sub-species in the US. The geographical range of this sub-species is much smaller than that of the other two. It is said that this species is currently kept and bred in Europe. 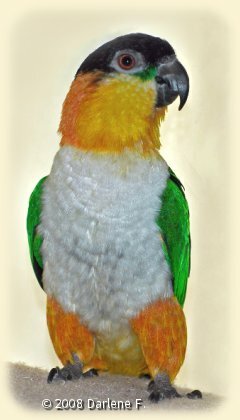 The White-belly Caique has a fluffy white breast and abdomen, bright orange crown, nape, hindneck and upper ear coverts. The cheeks, throat and sides of the head are yellow. The wings, back, rump, tail and under tail coverts are green. Primaries and primary coverts are violet-blue edged with dark green. Flanks and thighs are yellow in P. l. xanthomeria, the common subspecies and are green in the nominate race P. l. leucogaster. The beak is horn-colored, legs and feet are fleshy pink to grey. The iris is a dark red-orange in adult birds. Immature White-bellies are a dull version of the adult with a heavy yellow wash on the abdomen and have varying amounts of dark feathering on their heads. The dark feathers can be intermingled with the orange feathers giving a brindle appearance, or can appear almost solid. While many pairs tend to have similarly colored chicks, mostly all light headed or dark headed babies, some pairs can have both light and dark headed chicks in the same clutch. The majority of the dark feathers will be replaced with orange during the first molt at about one year old. Any remaining dark feathers will be lost in successive molts and usually by three years old their heads are bright orange. Birds that have very dark heads as babies tend to have deeper orange color as adults. Black-headed Caiques are found north of the Amazon River in Brazil, Columbia, Peru, Venezuela, French Guiana, Guyana and Surinam. They inhabit the both the high forest, forest edges as well as flat savannah woodlands. These noisy parrots are frequently seen in family groups or flocks of up to thirty outside breeding season, and inhabit the forest canopy where they spend their days feeding on fruits, berries and seeds. When disturbed, they fly off, screeching loudly. Of the Black-headed Caiques, Pionites melanocephala melanocephala is the sub-species we are all familiar with. The Black-headed Caique has a fluffy white breast and abdomen, with a black forehead, crown and nape. Cheeks and throat are yellow with a green streak just to the front and below the eye. Neck is orange, wings, back and tail are green, thighs orange and feet grey to black. Beak black, iris is red in adult birds. There is one subspecies, Pionites m. pallida, in which all orange feathering is replaced with yellow feathers. 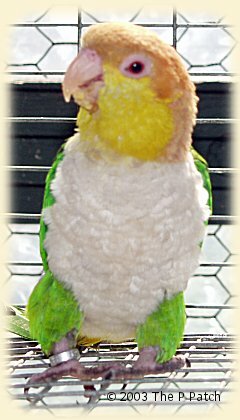 Some believe hybridization (both in captivity and possibly even in the wild) accounts for some of the color variations we see today among the Black-headed Caiques. Immature Black-headed Caiques have duller plumage with a heavy orange-yellow wash on the breast and abdomen. Eyes are dark and the beak is gray in young birds. Copyright © 1998-2008 Shady Pines Aviary - No part of this page may be reproduced without the express permission of the author.